Holacracy is a method for people to work together. 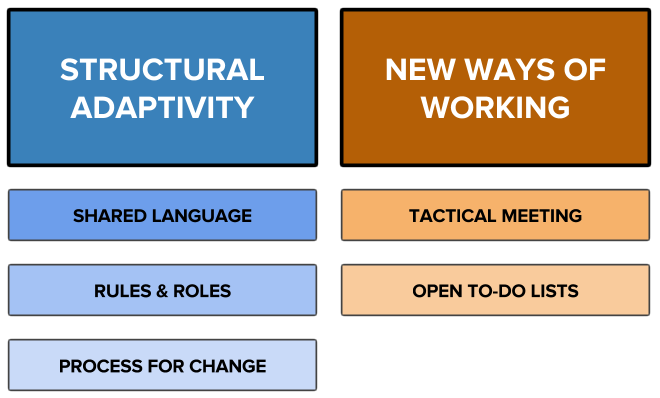 It provides a shared language and defined work processes – especially processes for running meetings – that help create clarity on what-is-actually-happening and who-does-what and allows for easy adaptation of an organisation’s structure. “Some of Holacracy’s features.” Illustration By Jordan Husney. “Shared Language” means terminology that helps mutual understanding. In Holacracy, “Tactical Meeting” “Governance Meeting” “Project” “Objection” “Accountability” “Domain” and other terms are well-defined. Collaborators know what it means when somebody speaks of a “tension” (a felt dissonance between what is (current reality) and what could be (purpose)).Compare this with conventional uses of “problem”, “issue”, “meeting”, “challenge”, “project”, “accountability” and so on: What do these words mean in your context? Is this understanding shared between everybody? “Rules” give a fundamental structure for how to work together: who has what permissions? In Holacracy, the rules for working together are codified in the Holacracy Constitution.What are the rules in your working context? Are they clear? Are they explicit? Do they change? How? “Roles” allow for the differentiation of personal interests and egos from purpose-driven functions. Within a role, I might have a strong conflict with a coworker who is filling another role. The framework of role-based work allows processing this conflict into constructive action. Holacracy offers a defined Process for Change. Any tension that anyone senses from any role can be processed into a meaningful change. Improvements do not stay stuck in politics, fear or inertia.